Just when you think Mason cannot get any better, it pulls a fast one on us and raises the bar all over again. While this week’s announcement that the university will be expanding its territory and opening a beautiful campus in South Korea brings outstanding notoriety among East Asian countries, it is a campus that very few students will ever get the opportunity to experience first-hand. Perhaps more relevant to the Fairfax community, though, Mason celebrated the completion of its newest academic residential and dining facilities on Thursday just down the road in Front Royal. A $5 million gift from real estate developer Gerald T. Halpin, namesake of the G.T. 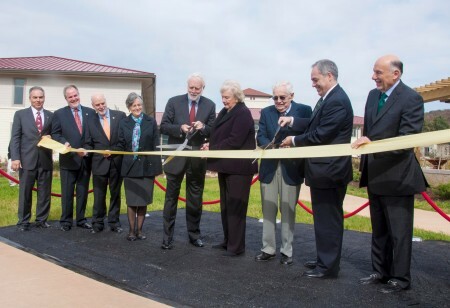 Halpin Family Living & Learning Community, helped bring life to a vision imagined by Mason and the Smithsonian that will allow the Smithsonian-Mason School of Conservation to foster and nurture future generations of conservationists. His generous donation will provide funds to establish an endowment that will provide scholarship opportunities for undergraduate and graduate students. The campus, where students spend a semester living on campus and engaging in the study of endangered species, includes research halls, dormitories and an animal hospital. Highly qualified world experts – including Smithsonian scientists, Mason faculty and colleagues from other conservation organizations – provide students with a hands-on experience in the most current teaching, research techniques and work in the field. To top it all off, students can work with resident animal keepers to care for red pandas, clouded leopards or the variety of birds that call Mason’s Front Royal campus home. In typical Mason fashion, the campus redefines the term Living Learning Community, a term that the university made popular with the wildly successful New Century College several years ago. In its LEED Gold-certified Standard residential complex, a facility consisting of green-roof technology and geothermal heating and cooling systems, there will eventually be 120 students who are allowed the opportunity to experience an atmosphere of creative, critical and analytical thinking on how to search solutions to some of the most difficult conservation problems facing society today. Mason’s partnership with the Smithsonian, and the rapid growth of such a unique campus, acclaims the institution as the only unit of the Smithsonian exclusively devoted to the study of wildlife conservation biology. Such growth as an institution is crucial in obtaining and maintaining a certain prestige that is now synonymous with Mason. It is pertinent for enhancing the experience of our university, Fairfax and beyond.